It's always interesting working from old texts. Sentences are phrased so differently to how we construct them today. I often skip the introduction in modern books because they are so dull and boring, but add a bit of oldey-timey phrasing and an introduction is an interesting read all on its own. I am currently working on making some Victorian patterns from an old catalogue which promises the user a cutting system which is of the 'simplest and most perfect possible manner'. Will it live up to it's own boast? Who cares! The boasting is worth a read just on it's own. I've transcribed the introduction in full as it is not the easiest read from the digital scan alone. I hope you enjoy it. To lay off patterns, and to cut, fit and make garments of every description, which will conform in all cases with the prevailing fashion and fit properly, is by no means an undesirable attainment. 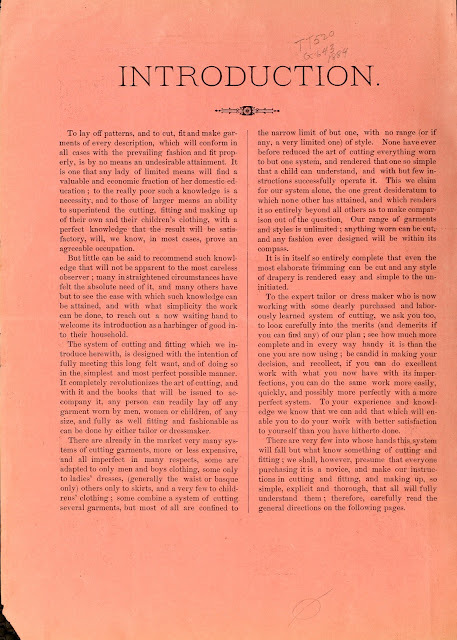 It is one that any lady of limited means will find a valuable and economic fraction of her domestic education ; to the really poor such a knowledge is a necessity, and to those of larger means an ability to superintend the cutting, fitting and making up of their own and their children's clothing, with a perfect knowledge that the result will be satisfactory, will, we know, in most cases, prove an agreeable occupation. But little can be said to recommend such knowledge that will not be apparent to the most careless observer ; many in straightened circumstances have felt the absolute need of it, and many others have but to see the ease with which such knowledge can be attained, and with what simplicity the work can be done, to reach out a now waiting hand to welcome it's introduction as a harbinger of good into their household. The system of cutting and fitting which we introduce herewith, is designed with the intention of fully meeting this long felt want, and of doing so in the simplest and most perfect possible manner. 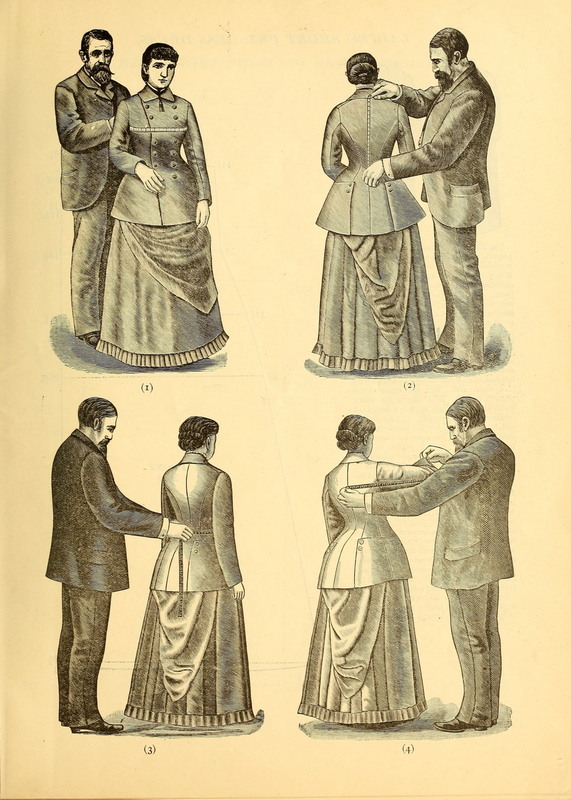 It completely revolutionizes the art of cutting, and with it and the books that will be issued to accompany it, any person can readily lay off any garment worn by men, women or children, of any size, and fully as well fitting and fashionable as can be done by either tailor or dressmaker. There are already in the market very many systems of cutting garments, more or less expensive, and all imperfect in many respects, some are adapted to only men and boys clothing, some only to ladies' dresses, (generally the waist or basque only) others only to skirts, and a very few to childrens' clothing ; some combine a system of cutting several garments, but most of all are confined to the narrow limit of but one, with no range (or if any, a very limited one) of style. None have ever before reduced the art of cutting everything worn to but one system, and rendered that one so simple that a child can understand, and with but few instructions successfully operate it. This we claim for our system alone, the one great desideratum to which none other has attained, and which renders it so entirely beyond all others as to make comparison out of the question. Our range of garments and styles is unlimited ; anything worn can be cut, and any fashion ever designed will be within it's compass. It is in itself so entirely complete that even the most elaborate trimming can be cut and any style of drapery is rendered easy and simple to the uninitiated . To the expert tailor or dress maker who is now working with some dearly purchased and laboriously learned system of cutting, we ask you too, to look carefully into the merits (and demerits if you find any) of our plan ; see how much more complete an in every way handy it is than the one you are now using ; be candid in making your decision, and recollect, if you can do excellent work with what you now have with it's imperfections, you can do the same work more easily, quickly, and possibly more perfectly with a more perfect system. To your experience and knowledge we know that we can add that which will enable you to do your work with better satisfaction to yourself than you have hitherto done. There are very few into whose hands this system will fall but what know something of cutting and fitting; we shall, however, presume that everyone purchasing it is a novice, and make our instructions in cutting and fitting, and making up, so simple, explicit and thorough, that all will fully understand them : therefore, carefully read the general directions on the following pages. You're right- that was a wonderful read in and of itself!! Where can I get my hands on this more perfect system??? 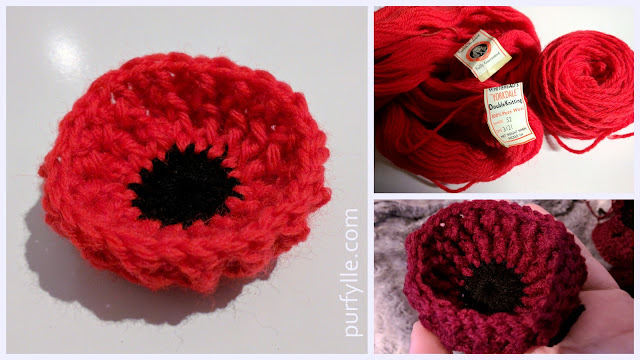 It's free to download the book - just click the book title in my post, but sadly the necessary accompanying rulers for marking up the patterns are a mystery lost to time. However I will be writing about how you can work around the problem of not having the special rulers so stay tuned! I purchased the complete set including the rulers two weeks ago in an antique mall. I'd love to know which edition and I'd love to see the rulers. 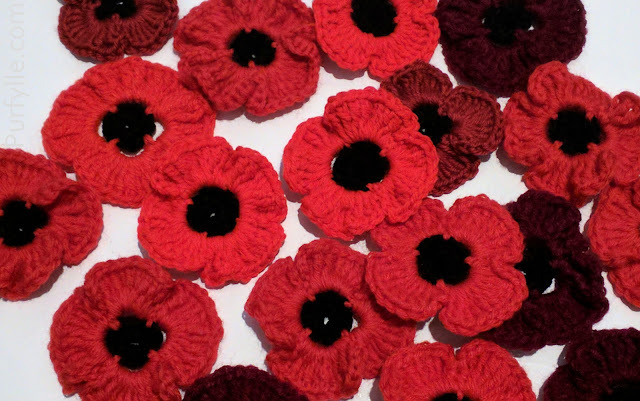 It is my intention to make them available to the public for free, in fact I hoped to have it done by now. I'll take a look at that publication, I'm sure I've seen the name before. Ok. Here's what I have. National Garment Cutter Book of Diagrams copyright 1892. 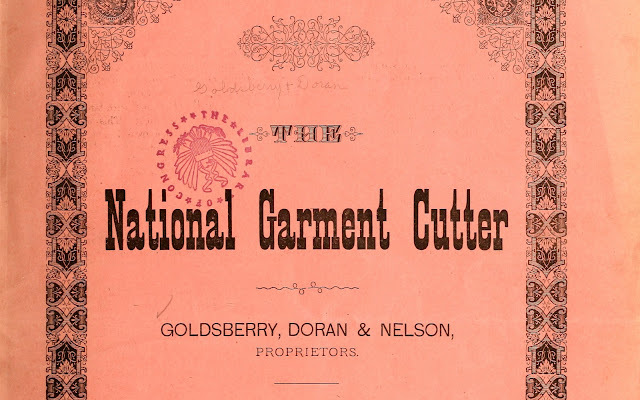 National garment cutter "a complete system for cutting all kinds of garments for men, women and children". The Voice of Fashion vol. VIII, No 32. Spring 1894. 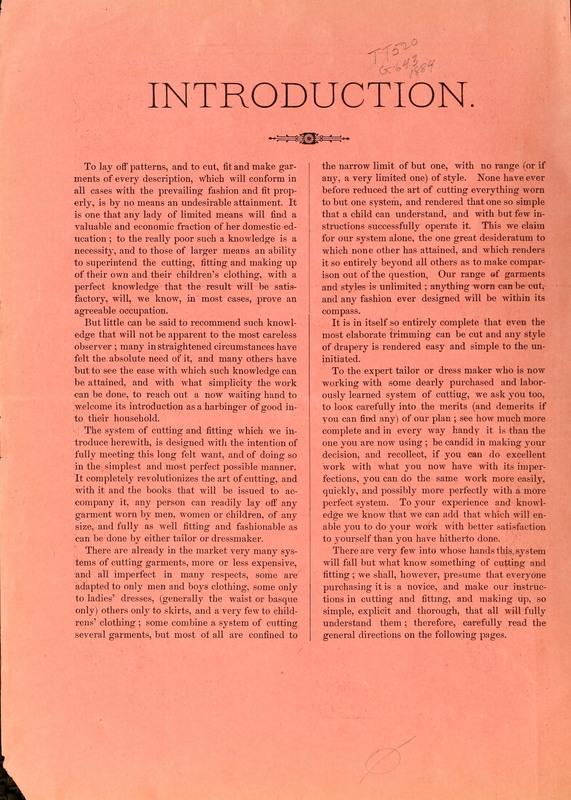 The Garment Cutter Instruction Book. set of rulers and garment cutter's curve. Not sure how to add pics here. If you provide email I can send that way. Hello Stella. I am finally getting around to emailing pics to you. Will be emailing shortly.. i look forward to hearing from you. Kathryn. They are absolutely wonderful! Thank you so much. I've sent you an email. I had definitely planned to have them up on the blog by now, they should be up in the next week or two. Thanks Stella. I'll wait for them.